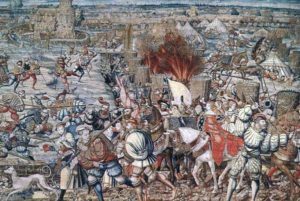 On February the 24th, 1525, almost 500 years ago now, the decisive battle that determined the supremacy over Northern Italy was fought in the large Visconti Park, just north of the city of Pavia in Lombardy. This battle is renowned for being the first example of “modern” warfare and also as being the first one in which hand-held firearms played a decisive role. 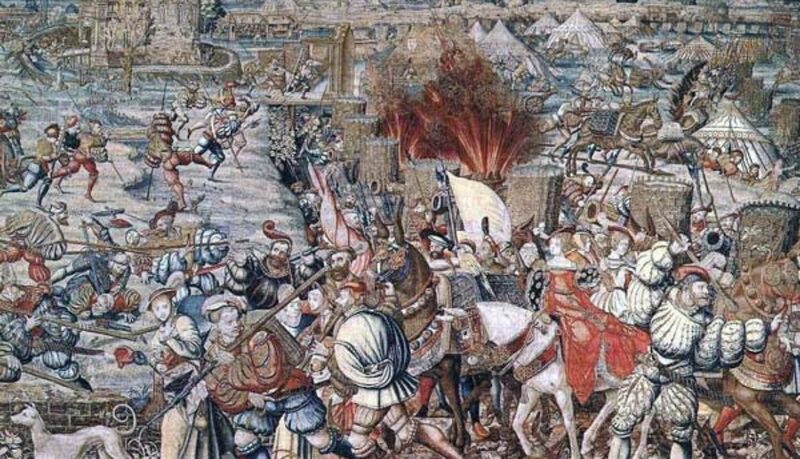 After years of struggle for the possession of Lombardy and a long siege of Pavia the French army suffered a devastating blow (comparable to the one at Agincourt) in which many high ranking commanders were killed and the French king, Francois I was caught. The emperor Charles V won and confirmed the Spanish possession of Lombardy for a long time to come. There are many artworks in museums all over the world that depict scenes of this battle. 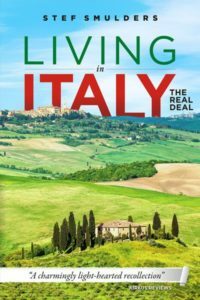 Legend has it that after being caught Francois was led away from the battlefield to a cascina, farmhouse, in order to eat some food. Unfortunately the farmer’s wife only had a few edible things available and so she had to improvise a meal from the broth, the eggs and the stale bread she could provide. Francois, being very hungry, appreciated the resulting soup so much that once freed and back in Paris he ordered his court chef to prepare it often. The improvised dish subsequently became known as the now famous Zuppa Pavese and is still served in restaurants of the region today. The battle is reenacted every two years in September at the small town of San Genesio ed Uniti, between Pavia and Milan. 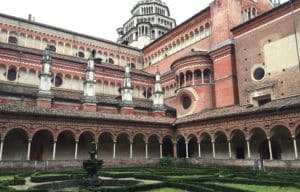 Pavia , at a short distance south of Milan, happens to be one of the nicest cities in the region for a nice stroll. All of Pavia can be visited on foot and along the way there are lots of quiet little squares with benches in the shadow of trees. Pavia is quiet during the lunch hour(s), but becomes lively at aperitivo time : go to the Strada Nuova and Piazza Vittoria to see the citizens meet, chat and show off, or try the Lounge Bar Minerva. The city (capital of Lombard Italy once, and the place where Frederic Barbarossa was crowned king) is a hidden gem in it’s own, as the Pavese are not very active in promoting their treasures, such as the San Pietro in Ciel d’Oro , San Michele and in particular the Certosa di Pavia abbey, a few km north of the city, which is definite must see for any visitor of Milan. Other sight not to miss are the Castello Visconteo (housing several museums and surrounded by a small park), the University complex (a maze of historical courtyards, in one of which there ia a cafe/bar, several museums as well), the Piazza Leonardo da Vinci with the three civic towers (Pavia used to have hundred) and the Ponte Coperto at the Ticino river. 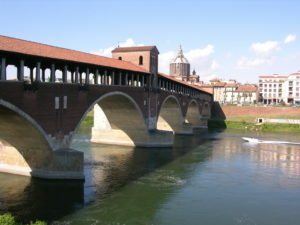 Running straight south from the Castello Visconteo to the Ponte Coperto is the main artery of Pavia city center, the Strada Nuova . Alongside it you’ll find the university complex and the Teatro Fraschini and a lot of shops and bars. Late in the afternoon the street becomes rather crowded with cars, buses, bikers and the strolling Pavese (all mingled through one another). Towards the Ticino river the street goes down rather steeply, which you’ll notice once you go back north again 😉 . 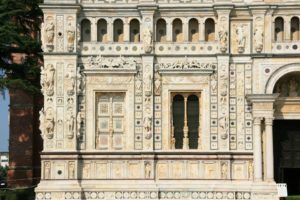 The most popular place to go to in Pavia to have a drink, an aperitivo , sit outside and view the citizens pass by is the Piazza Vittoria, or Piazza Grande as it is informally known. The square in reality consists of two rectangular spaces left and right of the Corso Cavour . On both parts you’ll find several bars, cafés and restaurants with outside terraces. Along the sides of the 14th century piazza stand several historical buildings , such as the medieval Broletto (municipal administrative see). 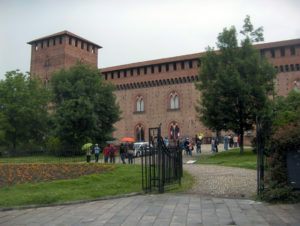 The Piazza Vittoria is also the place where city events such as open air concerts take place. 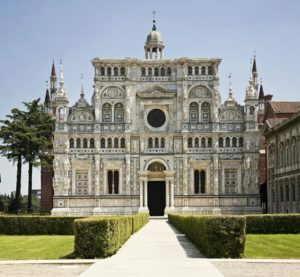 This important church, one of the major sights of Pavia, is situated a little peripheral of city center, at its own quiet square. The name, St Peter in the Golden Sky (not a Beatles’ song) refers to the former gilded wooden ceiling with which it was decorated. The first church on this location dates back from as early as the 7th century and is connected to the Lombard king Liutprand . The current Romanesque building is of the 12th century. 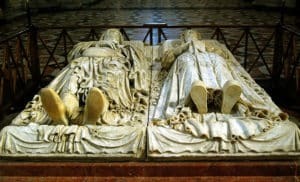 The importance of the San Pietro not only relates to its age and history, but also to the fact that the remains of two of the most influential philosophers of late antiquity (are said to) rest here, as well as those of Liutprand himself. 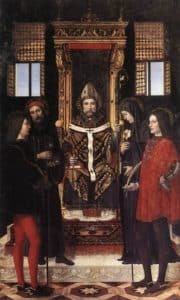 The remains of St Augustine are in the magnificent 14th century sarcophagus on the altar and those of Boethius are in the crypt. 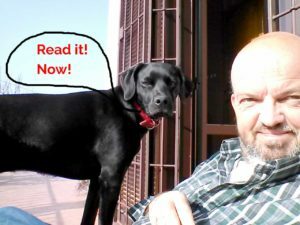 For the story of the vicissitudes of the remains of Augustine, see the Augnet website. St Augustine is the well-known founder of Catholic philosophy and writer of the ‘ Confessions ‘ and ‘ The City of God ‘. Boethius is less commonly known, but was the most read classic philosopher in the Middle Ages, with his work Consolatio Philosophiae (Consolation of Philosophy), still worth reading, if only for the magnificent style. He also made sure that the Greek classics were still accessible in the Middle Ages, when no one knew Greek anymore, as he translated a large part into Latin. The importance of the San Pietro is also testified by the fact that it is mentioned in the works of Dante ( Divina Commedia , see the plaque on the facade, text referring to Boethius: The body whence it was chased forth, lies down below in Cieldauro and itself from martyrdom and exile came unto this peace ), Boccaccio ( Decameron ) and Petrarch. 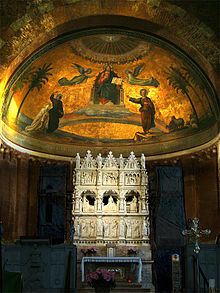 All popes visit the San Pietro at least once during their papacy, as did Benedict XVI in 2007. This 12th century church in Lombard-Romanesque style is a truly historical spot, as it was here that several Kings of Italy were crowned , among who the famous Frederic Barbarossa (1155), but also Berengarius I (888), Louis III (900), Henry the Saint (1004) and many others. 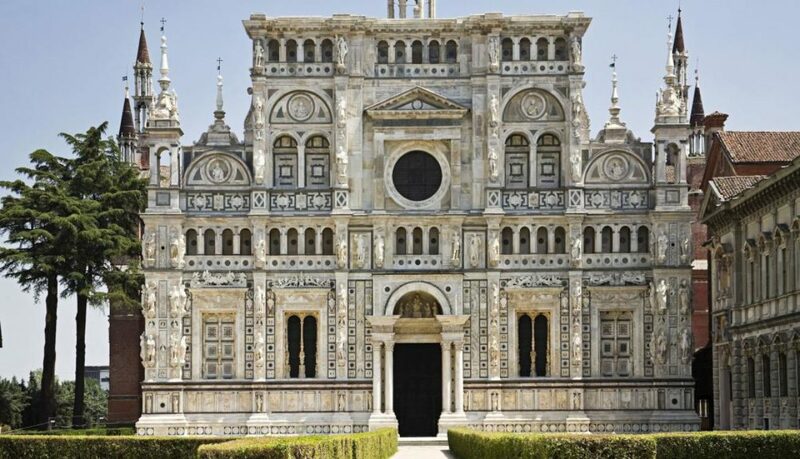 The architecture of the San Michele has formed a kind of prototype for other churches in Pavia, as for the San Pietro in Ciel d’Oro for example, but unfortunately the facade of the San Michele is in sandstone instead of brick. As a consequence, the decorations have deteriorated a lot over time. One of the better preserved reliefs shows St Michael killing the dragon of the Apocalypse. Inside you have to look for the mosaic (fragment) in the presbytery that displays mythological themes (labyrinth) and the themes of the months and the altar. In the nave and the crypt there are some extraordinary capitals , decorated with scenes of the Old Testament: Adam and Eve, Cain and Abel, Samson and the Lion etc. In the chapel to the right of the altar you’ll find a 10th century silver crucifix . This castle, built for Galeazzo II Visconti in the 14th century, seems to have been even more splendid in its time, as Petrarca (friend of the Visconti ‘s) seems to have said that it was the noblest of buildings, modern ones that is. No humanist could of course underrate the classic monuments. The castle has a square plan, with towers at the corners and a large courtyard with portico inside. Note the beautiful Venetian style windows from the outside (and enjoy the nice park around the castello ). 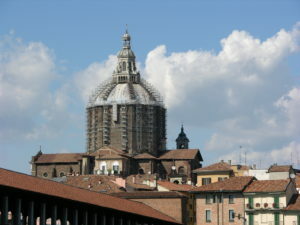 Petrarca actually worked in the castle, in the so called Torre della Biblioteca (left) as he was asked to catalogue the valuable manuscript collection. Unfortunately these were all lost during the sack of Pavia in 1527, when also the entire northern part of the castle was destroyed. The tower to the right is called the Torre delle Reliquie , as the precious relics of several saints (gifts from guests) were kept there. Ludovico il Moro had Leonardo da Vinci decorate the salons (blue skies with golden stars) of the current Museo del Risorgimento . The Università degli Studi di Pavia is one of the oldest of its kind in Europe, as it is first mentioned in an Frankish edict of 825 (!). It became a true university ( studium generale ) in 1361. Some famous scientists worked here: mathematician Girolamo Cardano and physicist Alessandro Volta for example. The university complex , along the Strada Nuova , is a maze of courtyards in which it is easy to get lost. In one of the courtyards (but where?) is a lively bar/café with terrace . A visit of the complex is an enjoyable experience as each courtyard is different, there are a lot of monuments to admire and there are shadowy places and benches to relax. Some of the historical lecture halls are architectural monuments, like the Aula Magna (resembles a Greek temple) , Aula Volta, Aula Scarpa and Aula Foscolo (not freely accessible). The university hosts a collection of museums of which the University History Museum is probably one of the most interesting. The complex along the Strada Nuova , as large as it is, is by far not the only building of the university of Pavia. Throughout the city there are many more sees of all the different faculties. The south east corner of the university block is taken up by a square that is dominated by three towers of about 50 meters high, that remain from the time that Pavia was a city of hundred towers, centium turrium . That at least was said of the city (as of many others), result of the fact that in medieval times the noble families all built their own watch tower as a sign of power and an escape in case of enemy attack. 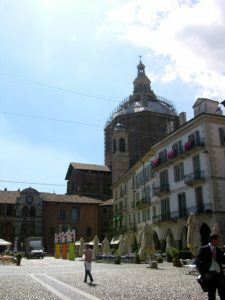 Apart from the towers at this piazza , two towers also remain at Via Luigi Porta and one at Piazza Borromeo . Foundations and base structures of many others are still to be found all over the city, incorporated other buildings of a more recent date. 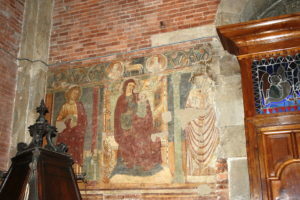 There are several pictorial testimonies of the amount of towers of Pavia in former times, one is the fresco of Lanzani in the San Teodoro , another is the marble decoration at the entrance of the Certosa monastery . The homogeneous architecture of the towers suggests that many were built in a relatively short space of time, probably 10/11th century. Nowadays the towers are in rather bad state as every now and then bricks come tumbling down … (watch out). You may actually dine in an ancient city tower at the Osteria La Torre degli Aquila in Strada Nuova . The Ponte Coperto is one of the most characteristic sights of Pavia, but unfortunately you won’t be looking at an ancient monument when you are visiting. The current bridge is a (somewhat adapted) copy of the original 14th century bridge, that was completely destroyed in WWII . The current bridge is no longer in line with the Strada Nuova , as it was decided in the post-war period to build the new one slightly further east. The new bridge is also wider, to allow for a better flow of traffic, and has less but broader arches. In the middle of the bridge is the chapel dedicated to St Nepomuk , patron of the shippers. There is also a plaque citing Albert Einstein, who lived in Pavia as a youngster. 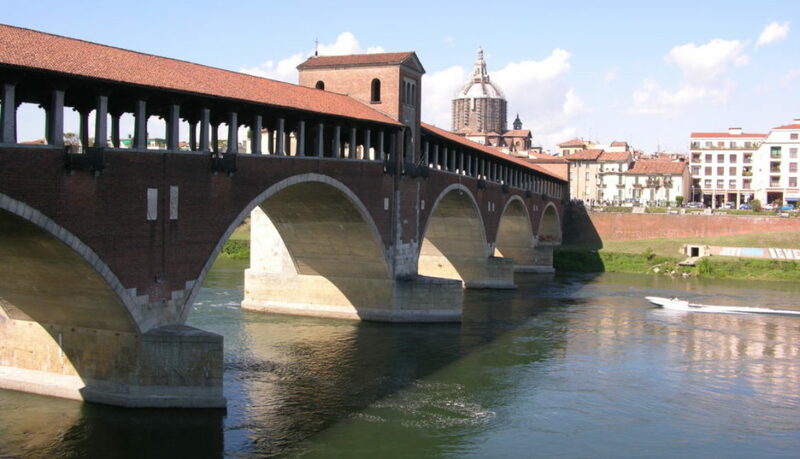 On the opposite shore lies the part of Pavia called Borgo Ticino , a part that the river regularly overflows at high tides. You’ll also find a monument to the women that came here to wash their clothes, lavandai , next to the bridge at the Borgo . To the right of the bridge is a nice meadow and park. The Via dei Mille that starts on the opposite shore in the Borgo , is a busy street with quite a few good restaurants. As you can see one may easily spend a whole day in Pavia and will probably want to return another time. The fastest way from Milan is to take the A7 to Genoa and then go off at Bereguardo, which will cost you about 2 euro of toll. 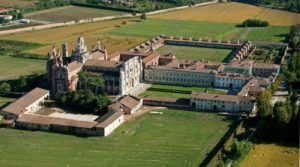 Another possibility is to take the provincial SS35 road to Pavia, which also passes the Certosa , which you may then visit along the way. There is a reasonably frequent train service as well, the trip taking only half an hour at a cost of about 4-8 €.